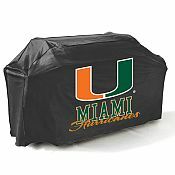 Show your Team Spirit while entertaining guests with these Outdoor Patio BBQ Grill Covers with College Logos. You can protect your BBQ grills from dirt, and other weather elements while supporting your favorite team. Your outdoor patio grill requires protection throughout the year to help extend the life of your grill. Protection from the rain, snow or sleet are a must to keep your exterior of your grill dry, clean and ready for use. Mr. Bar B Q Outdoor Protective Grill Covers are constructed with Durable and Weather-Resistant Heavy Duty Reinforced Vinyl Fabric with a Flannel Backing that protects your grill's finish from wind, rain, snow, sun and dirt. They include an adjustable drawstring to ensure a snug and secure fit. The Seasonal Design Collection can withstand even the harshest, cold winter elements and even resists cracking. These Seasonal protective covers are made to withstand and protect your outdoor patio furniture and patio accessories for all parts of the country and no matter what the weather conditions.